After a debut at Goodwood earlier the year, Peugeot showed off its new 308 GTi at the Frankfurt Motor Show. Available with either 250PS or 270PS, Peugeot’s latest crack at making a good hot hatch costs from £26,555 and hit the roads this summer. While it may seem odd for the car to come with two fairly close power outputs, Peugeot has in fact mimicked arguably the GTi’s closest rival, the SEAT Leon Cupra, which was launched last year in two even closer power guises: 265PS and 280PS. The reason for the split is that cynical product planners get to quote a low list price at the bottom end, knowing full well that most people will stump up for the higher-powered and more expensive version. 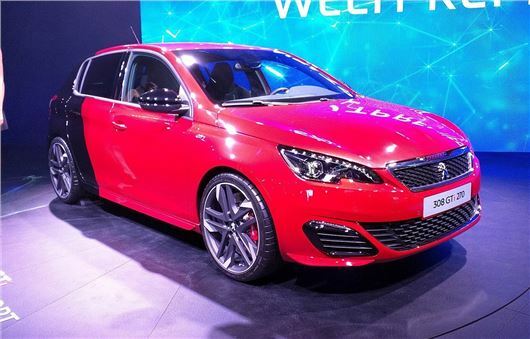 In this case, the 270PS 308 GTi costs £28,155 – still about £1000 cheaper than the more powerful Leon Cupra 280, mind. In fairness it’s not actually that cynical. There’s only a 0.2-second difference between the two cars when it comes to the all-important 0-62mph sprint (6.2 seconds against six dead), but the higher-powered car has a mechanical limited slip differential which should make it handle significantly better, plus bigger and meatier brakes, deeper bucket seats and a few 270-specific options. Options like the Marmite two-tone paint job you see in the image above (called “Coupe Franche” if you’re interested), which is only available on the quicker car, ergo a nice way of belittling regular 308 GTi drivers without having to say a thing, or having to race them. It costs £1300 though, so they may think your purchase an example of tasteless profligacy in return. The engine is a 1.6-litre THP turbo unit in both versions, highly modified over the lesser versions of the engine found in common-or-garden 308 models. It has all manner of its parts strengthened to accommodate a turbo with epic boost pressure – peaking at just 1900rpm and dishing up 330Nm torque.